And I’m Steve Ember with EXPLORATIONS in VOA Special English. Today, we tell about some beautiful, interesting and unusual places in the world. We tell you why they were chosen as Wonders of the World. The newspaper USA Today and the television program "Good Morning America" brought together a group of experts. The experts were to choose seven places that could be called Wonders of the World. The experts are marine biologist Sylvia Earl, writers Bruce Feiler and Pico Iyer, explorer Holly Morris and scientists Johan Reinhard and Neil deGrasse Tyson. They suggested and debated each possible choice, then agreed on seven places that could be considered Wonders of the World. We will tell about each of them. One of the group’s choices as a wonder of the world may seem unusual. It is not a real place or a building. Yet it is a place many people visit every day. 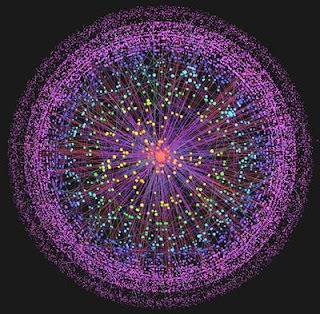 It is the Internet computer system. The experts said the Internet is a place where people can connect to anywhere in the world. They chose the Internet for three reasons. They said the Internet is an example of excellent engineering. 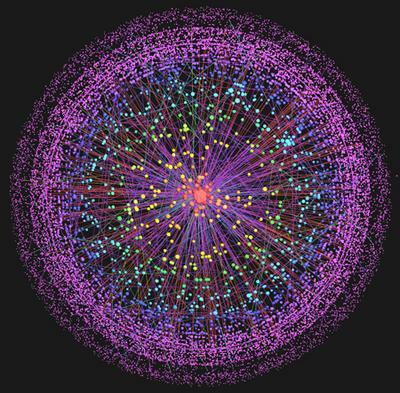 It shows how human beings are connected. And is the first step toward the goal of gathering all the knowledge in the world in one place. Another wonder chosen by the group is the Serengeti Plain in East Africa, an area of almost fifteen thousand square kilometers. The name comes from the Maasai language meaning "an extended place." The Serengeti has the greatest number of plains animals in Africa. It is home to millions of animals, including the rhinoceros, lion, leopard, zebra, gazelle and elephant. And it is one of the most visited areas of the world. People travel there to watch wild animals in their natural home. The Serengeti may be best known for the yearly movement of thousands of wild animals across the plains. At the start of the dry season each summer, the animals travel about eight hundred kilometers across the park in search of food. The government of Tanzania established the Serengeti National Park in nineteen forty-one. It has been successful in its efforts to increase the number of protected animals, especially elephants. Bruce Feiler said the experts chose the Serengeti as a wonder because it shows that human beings are working to protect nature. The experts chose the remains of the ancient Maya civilization in what is now Central America as another Wonder of the World. The experts said they chose the Maya pyramids as a way to honor the Maya people. The Maya civilization existed for about one thousand five hundred years. The Maya increased knowledge about science and mathematics. They developed a calendar and used their pyramid structures to observe and map the stars in the sky. And they built great cities of stone in what were jungle areas. But the civilization collapsed around the tenth century. Experts believe the reasons could include an environmental threat or wars. A fourth Wonder of the World chosen by the experts is the Old City of Jerusalem. The city is holy to Muslims, Jews and Christians. The experts said they chose the because of its place in religious history and its part in the struggle for peace among people with different beliefs. Important events in the history of the three religions took place in this area of about one square kilometer. The Dome of the Rock is a beautiful Islamic structure that protects the rock where Muslims believe Mohammed left on his trip to heaven. And all three religions believe that the rock is also the place where Abraham prepared to sacrifice his son Isaac to God. Nearby, the ancient Western Wall of the destroyed Second Temple is a holy place for the Jewish people. Jews from all over the world travel to the Old City of Jerusalem to pray there. The Church of the Holy Sepulchre is a holy place for Christians. Christians believe that this is where Jesus was killed, buried and rose to heaven. 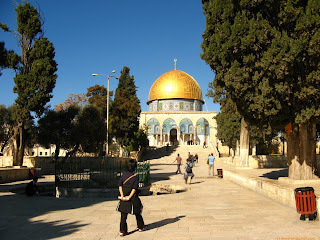 The Old City of Jerusalem is considered to be among the holiest places in the world. The experts chose them because of their religious importance and because they are among the last surviving structures of old Tibet. 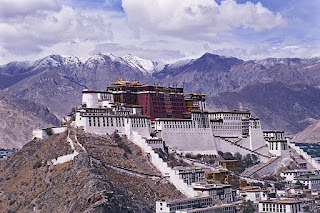 The Potala Palace was built by the fifth Dalai Lama, Tibet’s religious leader, in the seventeenth century. It contains the remains of several Dalai Lamas. It also has many works of art from Lamaism, Tibet’s development of Indian Buddhism. The last Dalai Lama to live in the palace fled in nineteen fifty-nine and has lived in exile in India ever since. 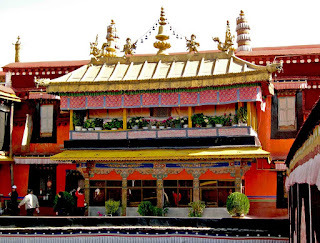 The Jokhang Temple is not far from the Potala Palace. It is the holiest place in Tibet, built in the seventh century. Buddhists visit the Temple every day. 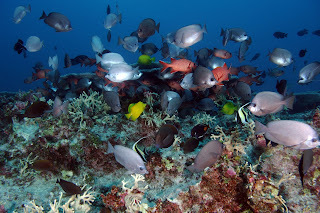 The Northwestern Hawaiian Islands Marine National Monument in the United States is another new Wonder of the World. President Bush signed a bill establishing the protected area in June of two thousand six. It is the largest protected area on Earth -- more than three hundred sixty thousand square kilometers of ocean and islands. The area is home to about seven thousand kinds of sea life. Many are found nowhere else on Earth. The experts said they chose the Northwestern Hawaiian Islands Marine National Monument because it is a model for protecting the natural areas of the planet. Marine biologist Sylvia Earl says she hopes the monument will influence other nations to protect parts of the ocean as they now protect the land. 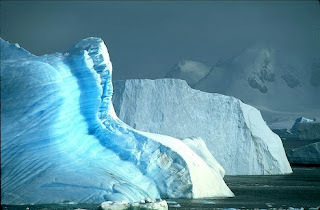 The seventh Wonder of the World chosen by the group of experts is the ice areas of the North and South Poles. The North Pole is an ever-moving sheet of ice that is hundreds of kilometers wide. It floats on the Arctic Ocean. The South Pole is occupied by the large continent of Antarctica. It is almost completely covered by a giant field of ice. The experts say they chose these areas because they are important to for the future of life on Earth. Many scientists say this future is threatened by the increased temperature of the atmosphere that is melting the polar ice. One study suggests that sea levels in the world could rise by several meters by the end of this century. As a result, low-lying areas of land could be under water. USA Today also wanted its readers to choose an eighth Wonder of the World to be added to the list. The paper suggested nine possibilities and asked readers to vote for one. The choices were the Panama Canal, the Great Wall of China, Machu Picchu in Peru; the Saturn Five rocket; the Taj Mahal in India; Victoria Falls in Zambia and Zimbabwe; Venice in Italy and the Grand Canyon. The readers chose the Grand Canyon in the southwestern American state of Arizona. The Grand Canyon is one of America's most famous national parks. Officials say about five million people from all parts of the world visit each year to see the huge hole in the Earth that is like nothing else in the world. The Grand Canyon extends four hundred fifty kilometers. Walls of rock fall away sharply from the edge. Far below is a dark line that is the Colorado River. On the other side, the rock walls are red, orange and gold. The bright colors are the result of minerals in the rocks. 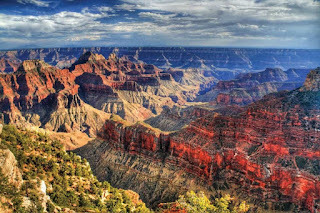 Visitors experience the Grand Canyon in several ways. They walk along paths down into the canyon. They ride mules to the bottom and back. They see the Grand Canyon from a plane, or on a boat riding over the fast moving Colorado River. The places we have described today are just a few areas that could be considered Wonders of the World. They are examples of both natural conditions and human technology. They show the continued progress that people have made throughout history as well as their concern for the future of the Earth. This Special English program was written by Nancy Steinbach. It was produced by Caty Weaver. I'm Steve Ember. And I'm Barbara Klein. You can see pictures of some of these places on our Web site, voaspecialenglish.com. Join us again next week for Explorations in VOA Special English. 1. The place where Abraham prepared to sacrifice Isaac is now ______________________. 2. A temple and a palace located in ___________ contain the remains of several Dalai Lamas. 3. The largest protected area on earth is __________________________ . 4. 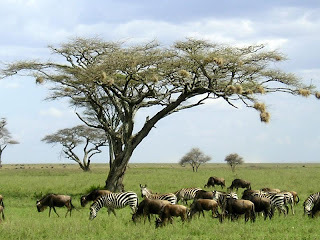 "Serengeti" is a Masai word that means "______________". 5. The Grand Canyon was formed by the ______________________ . 6. One of the experts who helped to write a new list of seven Wonders of the World was ___________________ . 7. The Internet was not chosen as a new Wonder of the World for the following reason: ______________________ . 8. The north and south poles were selected as wonders of the world because of ______________________ . 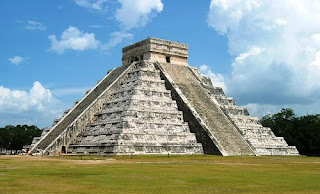 9.The Maya civilization ________________ around the Tenth Century A.D.
10. One candidate for the eighth Wonder of the World is _________________ .